Hiding user names enhances security. Attackers have to guess both username and password. It is also useful when you have a forced account setup in your computer. How to create a forced account. A forced account is a computer user account that is configured to destroy sensitive data in a forced logon or a logon as a result of forced username and password disclosure. When someone logs onto a forced account in your computer, your computer will destroy sensitive data. Thus a forced account provides another layer of protection for the data in your computer. The following steps create a user account, which you can use it as a forced user account. Click Start and click Control Panel. Click Add or remove user accounts under User Accounts and Family Safety. Click Create a new account. Type in a user name, which will be a forced user account name. Select the account you just created. Type in a password for the user account and an option password hint. The above instruction is applicable to Windows Vista and Windows 7. Windows XP has an equivalent instruction but each step is not exactly the same as the above. 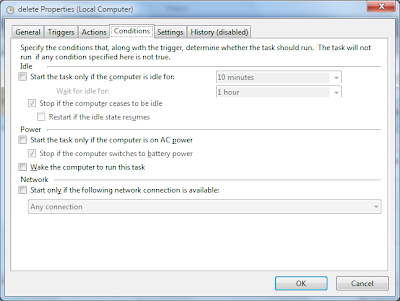 1) Select Start > All Programs > Accessories > System Tools > Task Scheduler. 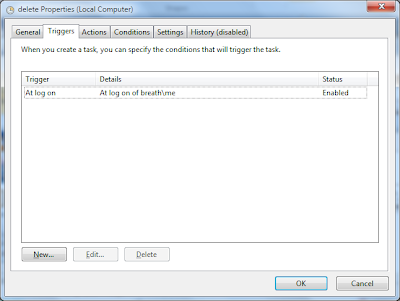 3) Enter task name- any name of your choice. 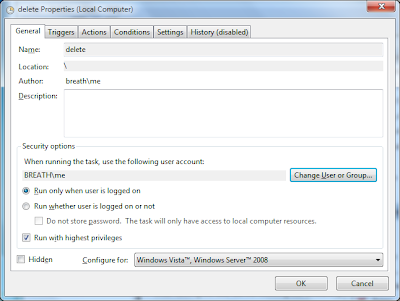 4) Enter the administrator username under "When running the task, use the following user account:". 5) Check 'Run with the highest privilege'. 6) Select trigger condition as "At logon" with the username of the forced account in Triggers tab page. 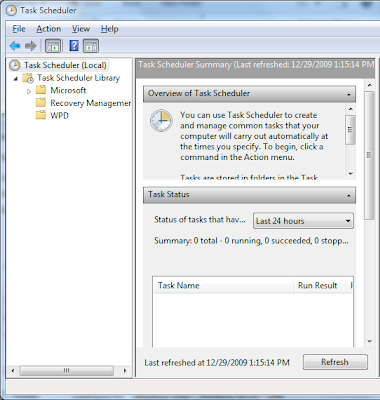 7) In Actions tab page, enter "c:\program files\bin\sdelete" or an alternate location of sdelete.exe program in your computer. In the argument field, enter "-s 'c:\users\confidential'". 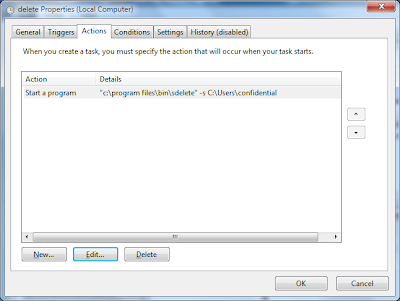 You can subsitute 'c:\users\confidential' with your own folder that you want to destroy. 8) Uncheck all in Conditions tab page. 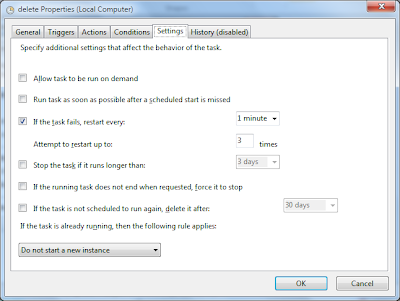 9) Check "If the task fails, restart every" in Settings tab page. Note: If you do not have SDelete, you can download it from this Microsoft web page. The Virus Experts blog recently hand picked 7 must have laptop security software. According to the blog, LAlarm is one of the seven must-have laptop security software. Highlight the user you want to log into automatically, then check the box for "Users must enter a username and password to use this computer"
Click on Apply or OK.
Freesound.org provides a large number of free quality sound files. In order to download sound files from this web site, you have to register. The files are free for non-commercial use according to the web site. You can search sound files by keywords at freesound.org. GRsites.com provides many free sound files. Here are some categories you can choose from. Enhanced zone detection ability - allows faster and more reliable zone change detection. You can easily find Christmas sound on the Internet. The sound search engine findsounds.com lists some sleigh bell sound files (in .wav format). Please note that the sound files on the Internet may require a license depending personal or business use. A beep sound is played when you press Win+L. It means theft alarm is armed. You can use LAlarm in a guest account or other low privileged user account as well. * You still have to login as administrator to install it. Louder siren sound for theft alarm and panic alarm. Enhanced Email tab in Options. A user friendly enhancement in Options Email tab. When an alarm goes off except theft alarm, there is a mute button on the screen. The mute button allows you to stop the sound. By the default setting, the alarm sound will continue until the mute button is pressed. You can configure LAlarm to press the button automatically. Append "-mute30" string to the end of the sound filename. For example, chirping-mute30.wav. After the above procedure, LAlarm will press the mute button 30 seconds after the health alarm going off. As a result, the alarm sound will stop. You can specify a different amount of time instead of 30 seconds. You can also configure other alarm by using the above procedure above except panic alarm and theft alarm. This tip applies to LAlarm version 5.5 or later.